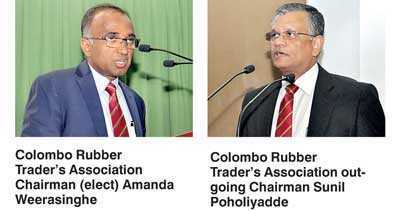 The Colombo Rubber Traders’ Association (CRTA) last week called for immediate to boost production as output levels have dropped sharply in recent years. “Currently RSS prices have stabilised at around Rs. 260, which is not at all sufficient for a viable industry. This price has increased due to an increase in crude oil, and also due to major rubber producing countries restricting exports in December 2017. The production of natural rubber has had a marginal increase from 2016 to 2017, reaching 83.1 million kgs which is merely an increase of 4 million kgs,” he noted. There are three factors that the industry has to seriously focus on, namely, the drastic drop in production, lack of land, and cost management, he emphasised. Several years ago, the country produced nearly 150 million kgs and came down to a mere 60 million kgs two years ago, noted Poholiyadde. “There are many issues connected to the drop in production which need to be addressed. Almost 70% of the rubber production in the country is in the hands of smallholders,and only close to 30% is in the hands of the corporate sector,” he added. Poholiyadde further stressed on the fact that production has dropped by 50% within a very short period of time, mainly due to the price drop and farmers moving out to different areas. Innovation and education needs to be passed down to the farmers for the industry to grow in the near future, he pointed out. “In order to attract more employees, we need to seriously look at the increase in productivity to reduce cost with high yielding better maintained plantations. Further, most of the smallholders currently supply low quality RSS to the manufacturers of the tyre industry, and an attempt should be made for them to improve the quality of the rubber produced, which should definitely bring them more revenue to remain in the industry,” insisted Poholiyadde. “The association has survived for nearly 100 years and plays a big role in the rubber industry. We have not stuck to tradition but have changed with time for the betterment of the industry, and plantations do play a vital part in our association,” he added. Since 1876, the rubber tree has not been replaced in most places by new innovations such as nano technology and science and must be continued to be so, insisted Chairman Elect for 2018/2019 Weerasinghe. Nisanka Seneviratne was appointed as the new Vice Chairman of CRTA. John Keells Holdings was elected as the associations’ broker representative under the nominations of the Colombo Brokers’ Association at the AGM.